It's been another week of forward progress, despite a reduction in miles to gather my strength for this coming weekend's 50 mile event in Spain. On Tuesday, Wednesday and Thursday I run for an hour at the altitude centre. I've notched up the altitude to 3000M now and running at a steady pace for 8 minutes, then at sea level for 2 mins recovery walk, then back up to 3000M and 8 more mins. It's interval training but made a whole lot harder by oxygen being in short supply. I did some strength work at the gym and my usual weekly 3 mile speed session where I managed another improvement of 15 seconds over last week which I'm very happy with. I did an extra unplanned 10k on Friday, at medium pace, just under 8 minute mile and had a rest day on Saturday. Well, I say rest, it was in fact taking my son to Chester Zoo, so a pleasant 5 hour stroll in the sunshine. On Sunday I felt the urge to do a quicker mid distance session to make up for not doing a long run. I set out and just chose my route as I ran, starting with a climb up to a local monument. The first mile is uphill on the road with a 200ft elevation gain. I held around 7:30 minute miles and decided that I might as well see how quickly I could run the whole route. It's was a trail route with plenty of stiles to negotiate, and some rough terrain mixed in with good paths and the odd short section of road. At half way I was still on 7:37 average, but knew the way home was an overall elevation gain with some sharp hills so I'd have my work cut out to try and maintain it. However, much to my surprise I did manage it, finishing 10 miles in 1:16:17, average 7:37 minute miles. 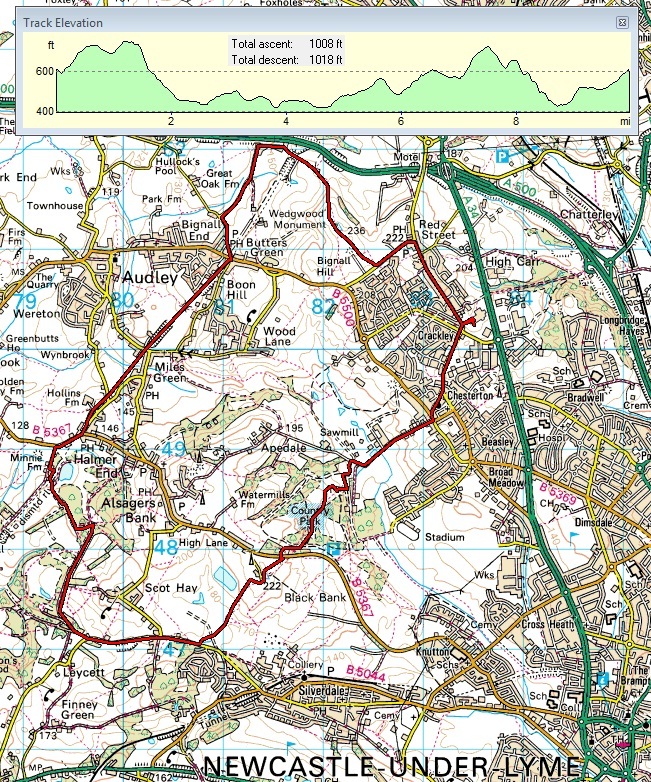 I'd have been happy enough with that time if it was a flattish road run, but the route was rough, had a lot of stiles to climb and also had 1000 ft of elevation gain. I was surprised at how comfortable I was running at pace on the flat sections. My breathing seemed easier than normal, and everything just flowed very well. My fitness is very good, even if my repaired groin injury is untested over multi-day distances. I just need to maintain this level until I get to Nepal. So, this coming weekend is the last big stepping stone. I always like to do an event that is equal in distance and as close in difficulty as I can guess an upcoming events' 'long stage'. In Nepal the long stage is 47 miles and will include around 2500M of elevation if I remember rightly. I was originally going to take part in the Round Rotherham 50 before I saw the Nepal course notes. Then I realised that the RRR50 was too easy. 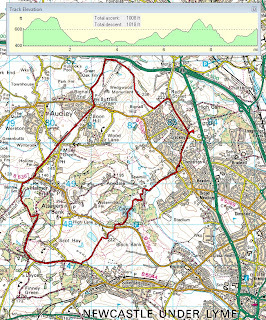 The course doesn't have any hills and has quite a lot of road and hard footpath. 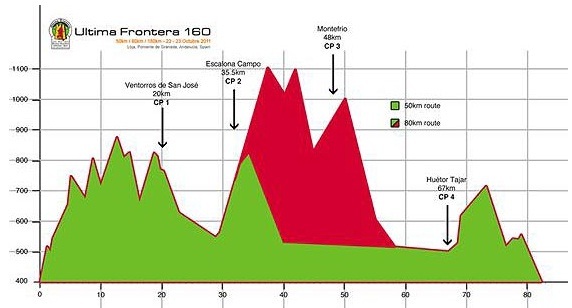 So, just a few weeks ago I signed up to do the 80km race in the Ultima Frontera . The distance and altitude, as well as the temperature should be almost identical to Nepal. Ok, the terrain will vary, but it's a close match I think. I'm not going to be treating it like a race, just as a Nepal training event. I'm going to be carrying a full weight race backpack, which will include sleeping bag and sleeping mat, as well as all the required kit, waterproofs and food etc. So, I may very well be bringing up the rear end of the field but I'm doing it for a Nepal confidence booster. I fly out to Malaga on Friday morning, then it's a bus ride to Loja in Andalucia. An overnight stay in the sports hall and a morning start with a 16 hour cutoff. 2700M of ascent is quite considerable, so I'm expecting this event to be a very stern challenge indeed. 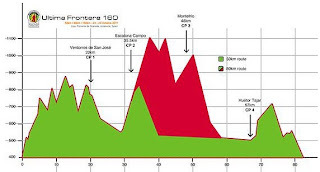 You can see the elevation profile below, and see the climbs up to 1100M. I'm going to try and enjoy it and not flog myself to death! I've only got one more event after this one, a 26 mile run in the Peak District; the 6 Dales Circuit, which barely even registers as an event after this. I am doing it 3 days before I fly to Nepal, which is a little risky, but I don't feel the need to taper to be honest. I'll report back next week after my trip to Spain. Have a good week.